This is a gripping Australian police procedural featuring Detective Sergeant Gemma Woodstock, now of the Melbourne Police. Sarah Bailey's debut novel, The Dark Lake, was set in Gemma's home town, Smithson, in rural New South Wales, where she began her police career. The opening finds Woodstock in bed in a hotel with an unnamed businessman, when she is called out to a murder scene. An elderly rough sleeper has been knifed in a particularly vicious way. Gemma's professional partner, D.S. Nick Fleet, who is already at the scene, immediately thinks the murder is drug-related, although there is no hard evidence to suggest that it is. Their boss, Chief Inspector Toby Isaacs, puts Gemma and Fleet on the case, and is eager that they should wrap it up as quickly as possible. It appears there is a witness, a female down-and-out who was a friend of the deceased and is very upset. She only knew the victim as Walt and has no further information as to his identity. Gemma and Fleet get stuck in to the case, but have not progressed very far when a sensational murder is committed in Melbourne. Sterling Wade, a very much up-and-coming soap turned film star, adored by teenagers and women all over Australia, is knifed on the set of a big-budget film destined to promote him instantly to Hollywood. His girlfriend, Lizzie Short, who is also appearing in the film, is devastated, as is the female lead, Ava James, a famous Hollywood star. The crime was actually caught on camera, but in the scene Sterling was actually being attacked by a gang of zombies, all wearing masks and carrying knives, so although the police watch it many times over, they can get nothing from it. Gemma is at first thrilled that she and Fleet are put in charge of the case – less so when she realises how difficult it is going to be, and she also regrets being taken off the rough sleeper case, as she has a strong social conscience. Sterling Wade was actually a country boy, coming from a farming family in Karadine, a small town in New South Wales, which happens to be close to Gemma's home town of Smithson. 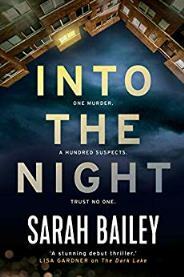 This is an extremely convoluted plot, dealing not only with the crimes, but with Gemma's psychological problems, which were obviously featured in Sara Bailey's first novel. Psychologically, she is a complete mess, which could be off-putting if it were not for the absorbing mystery. A really good read for film buffs.